Well, now I’ve done it. Beholders. Beholders are aberrations from the furthest planes of the cosmos. They have a minor ability to influence reality around them, most specifically when they sleep. If a Beholder dreams about a Beholder, it “reproduces” – that dream comes to life. As a result, every Beholder is different. Some are brown, some are purple, some are scaled, some are leathery, some have tendrils, and so on and so on. There are also genuine variants, with creatures like the Death Kiss ( a one-eyed starfish-octopus with mouths on its tentacles), the Overseer (basically a fleshy eye tree), the Eye of the Deep (it has lobster claws), and others. 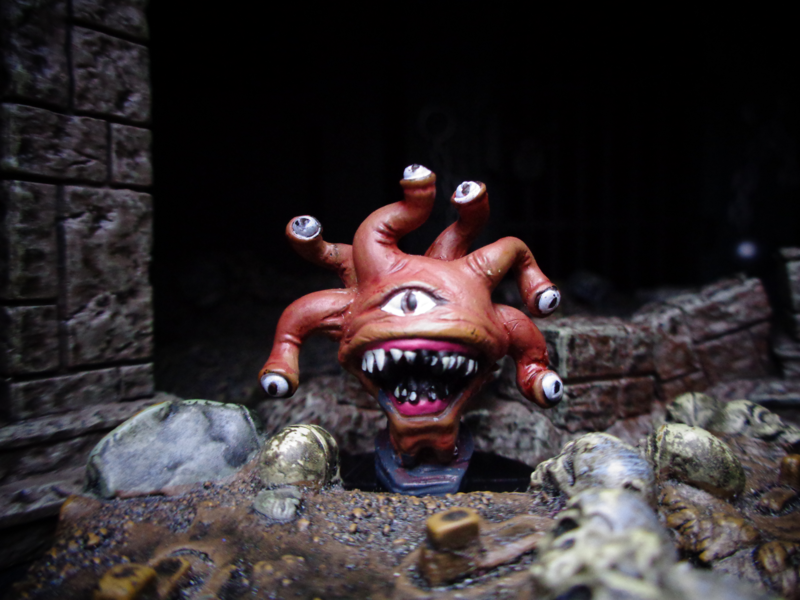 So of course, Dungeons & Dragons Miniatures has taken advantage of this by introducing Beholder miniatures – though oddly, many variants (such as the ones I just mentioned) have no representation… yet. The thing is, these figures end up horribly expensive on the secondary market after the fact. I had all the original ones, but then lost them in a move. 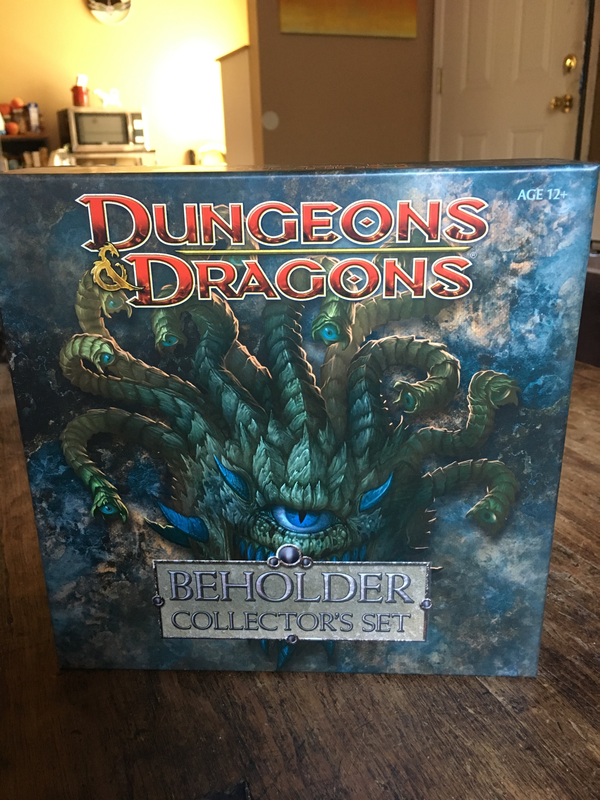 Recently, I managed to reacquire every single Beholder – I even found someone local who was selling the special collector’s set! And trust me, you can’t find those figures anywhere. But… but hahaha… but here they are! So I’ll show them off. All of ’em. This is mostly in chronological order, though a few have been shuffled around to fit thematically. 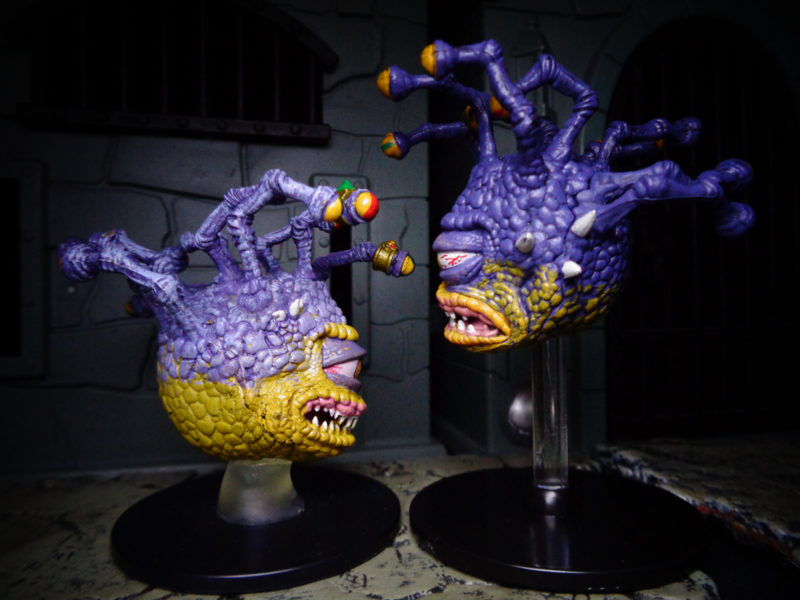 The first Beholder produced was the Gauth in 2004. It’s a variant – only “medium” sized, only six eye stalks, and so on. In fact, it should have a ring of tiny eyes around its central one, but that’s a different story. Gauths are smaller, with different eye rays, and devour magic. It’s about the size of a humanoid torso, too. 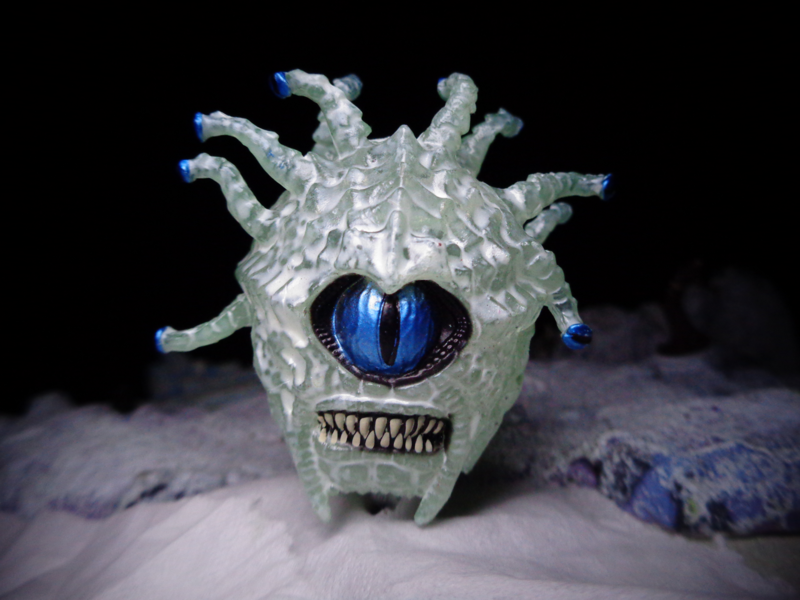 Deathknell in 2005 gave us the first true Beholder. Now, here’s another chance to discuss some basic things about these creatures. Firstly, he’s “large” – as in, almost as big as a VW Bug. An eyeball monster like this si soemthing you would expect to be kind of small, but that really isn’t the case. 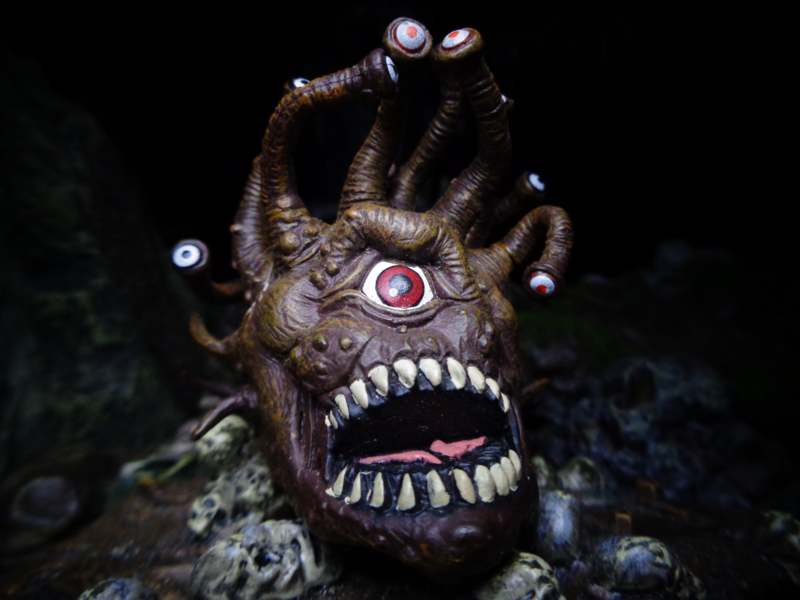 A Beholder can frickin’ eat a person. 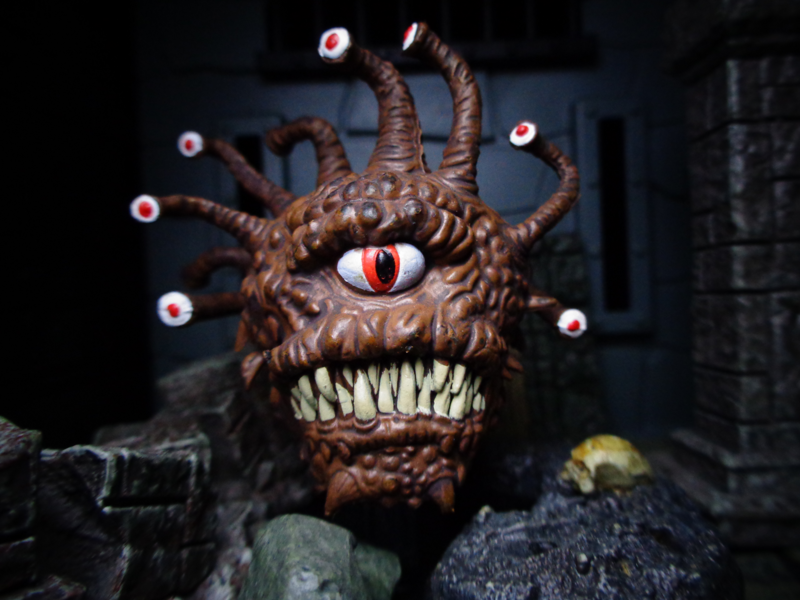 Anyway, as this is the classic Beholder, here’s the way his eyes work: The central eye projects anti-magic in a cone shape in front of him (sorry, Wizards! ), while the individual eye stalks can fire rays of (here goes) Charm Person (hypnotism! ), Charm Monster (monster hypnotism! ), Sleep, Enervation (slowness), Telekinesis (moving large objects, tossing people around), Fear, Petrification, Moderate Wounds (which hurts badly), Disintegration, and DEATH. And they have no limits on how many times they can use each ray (and even two or three in a turn! ), though that central eye’s cone affects the rays (the Beholder can turn it off, though). So yeah, Beholders are insanely difficult opponents, and actually don’t get used all that much in games because they are so unfair. 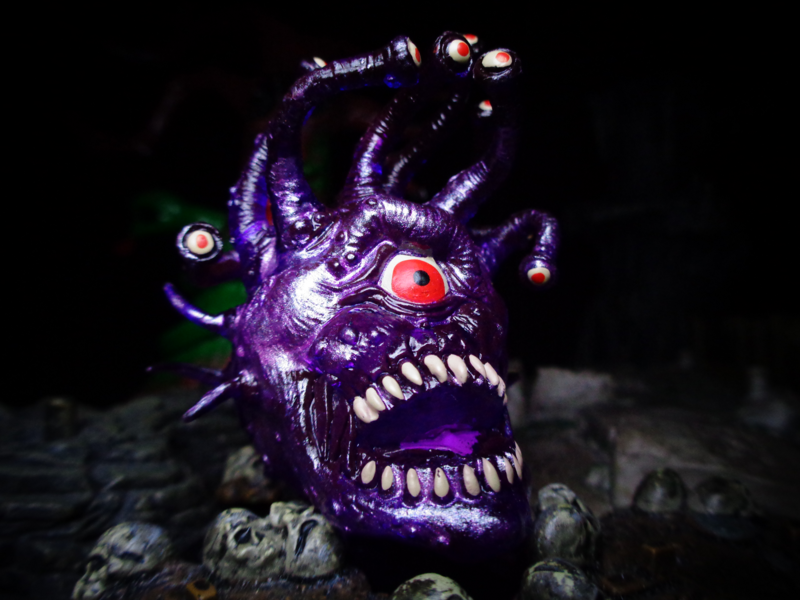 Unhallowed in 2007 gave us the Beholder Lich. Similar but not identical to the Death Tyrant (there will be a Death Tyrant mini in February 2019), this undead Beholder has traded in his antimagic eye for eternal un-life. The eye rays are more necromantic in theme, of course – lots of animating or controlling dead, and causing things to rot. 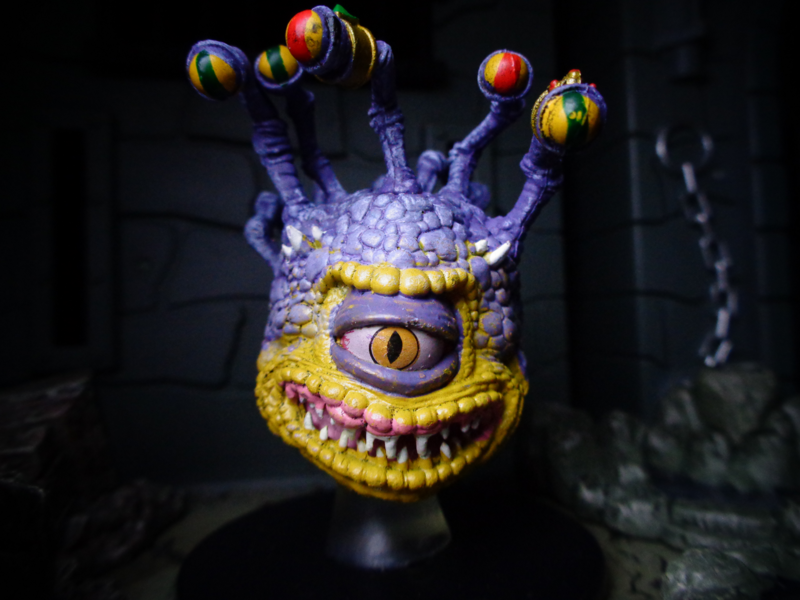 This is not the most expensive of the Beholder minis, and since it lacks easy-to-scuff eye paint, it holds up pretty well if you feel like carrying it around. 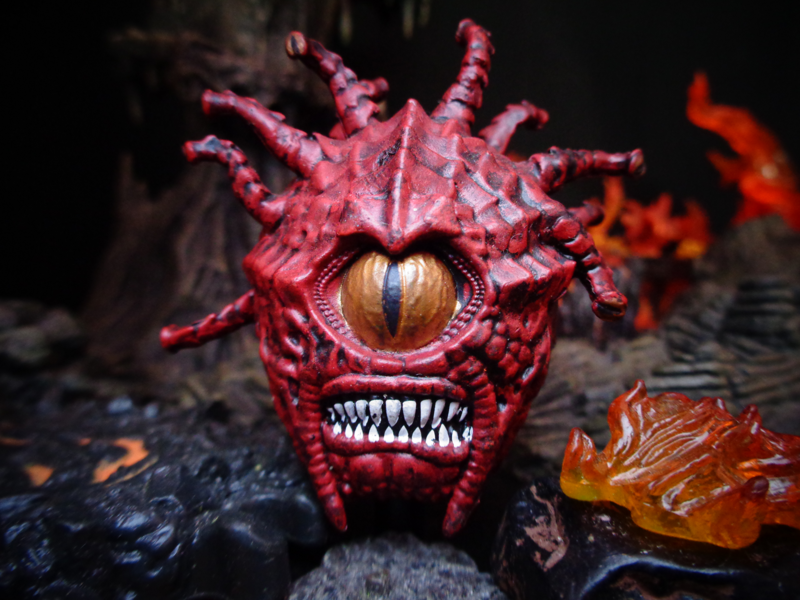 Dungeons of Dread in 2008 gave us the Eye of Flame, a Beholder variant that – you guessed it – shoots fire from his eye rays! The big eye’s central cone makes targets vulnerable to fire, too. Also, his eye paint holds up well. The Beholder Eye Tyrant came in Dangerous Delves in 2009, and you know what? 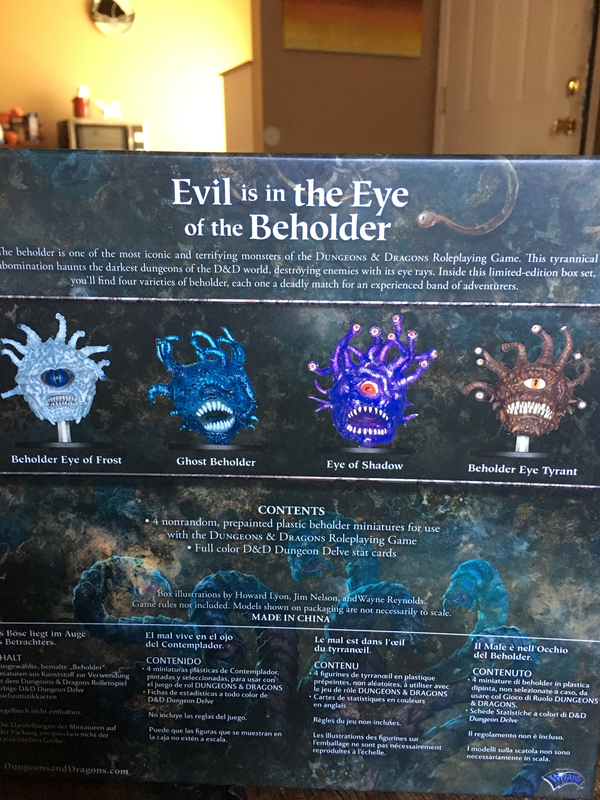 They really neglected giving us a lot of Beholders. Well, up to this point, that is. 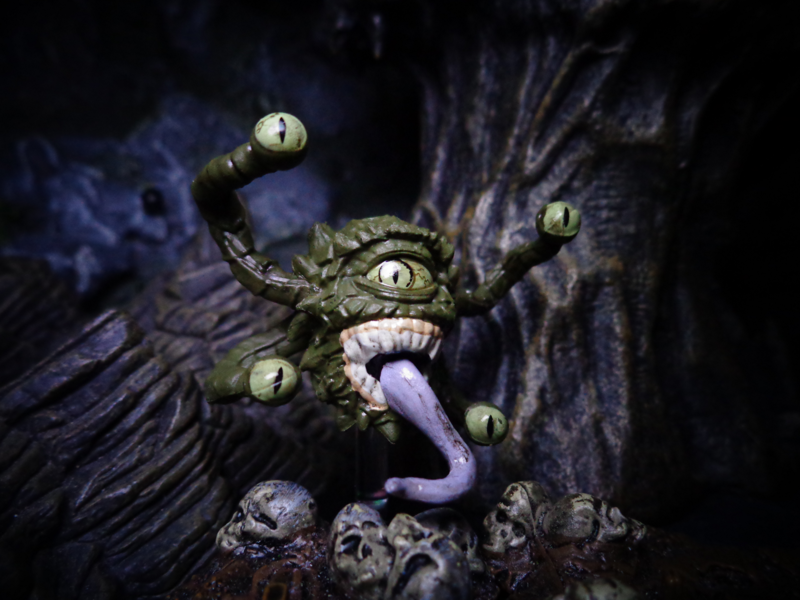 While the Eye Tyrant seems basic – and in fact, Eye Tyrant is a nickname for the species as a whole, there is a variation of Beholders called the Eye Tyrants, which are most known for willingness to work with other creatures. Not work for them, work with them. Over them. As a tyrant. The infamous Xanathar is one of those. Anyway, we’re going to jump out of timeline a little bit to 2010 now. You just can’t find this set anymore. You really can’t. Individual figures from it go for INSANE amounts. And yet, a shop near me had two in stock. For not much more than the original retail price. AMAZING. Anyway, I got this, and then reacquired all the others. No regrets. The Eye of Shadow is connected to the Plane of Shadow, and has eye rays themed to darkness, death, and undeath. It can also teleport in shadows or go invisible. 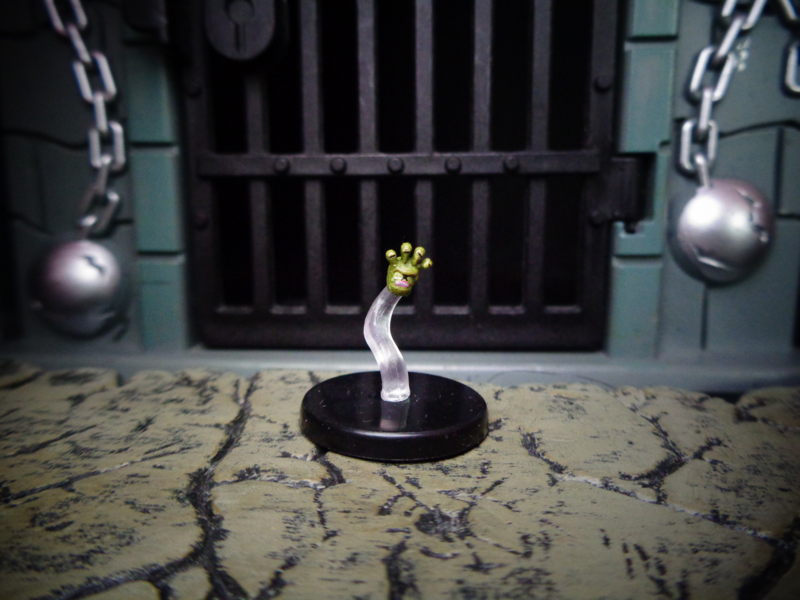 The Ghost Beholder is, of course… a Beholder ghost. 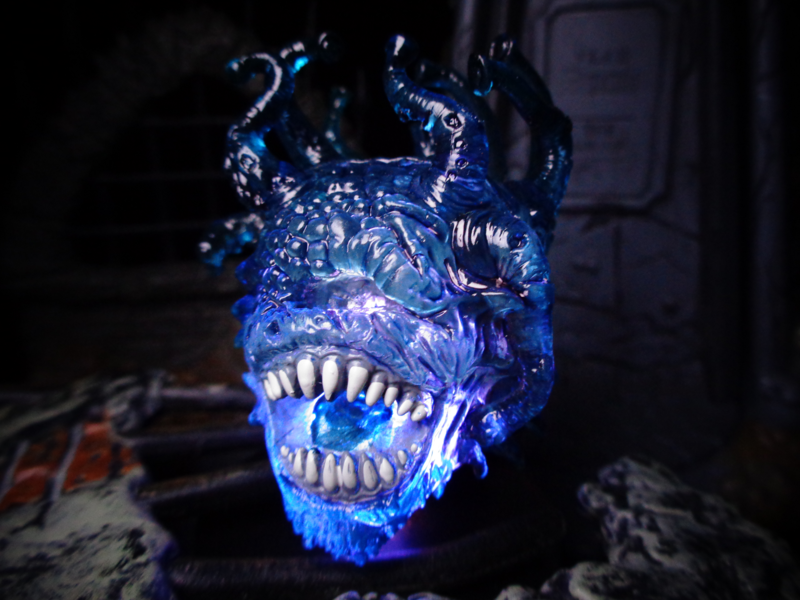 You know, with this, the Lich, and the upcoming Death Tyrant, we might have zombie, ghost, and skeleton beholders! The Eye of Frost’s particular powers should be obvious to you by now. And yes, it really looks great with the Eye of Flame. 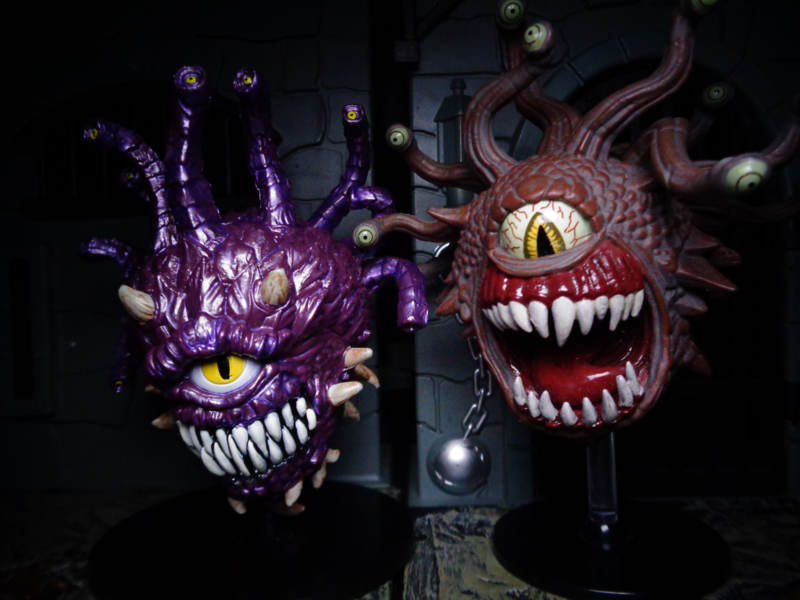 Anyway, moving back to 2009, the Legendary Evils set gave us the Beholder Ultimate Tyrant. This figure was visible in the booster packs, so it shouldn’t be that rare or expensive (but you should see what it goes for on ebay. Yeesh). 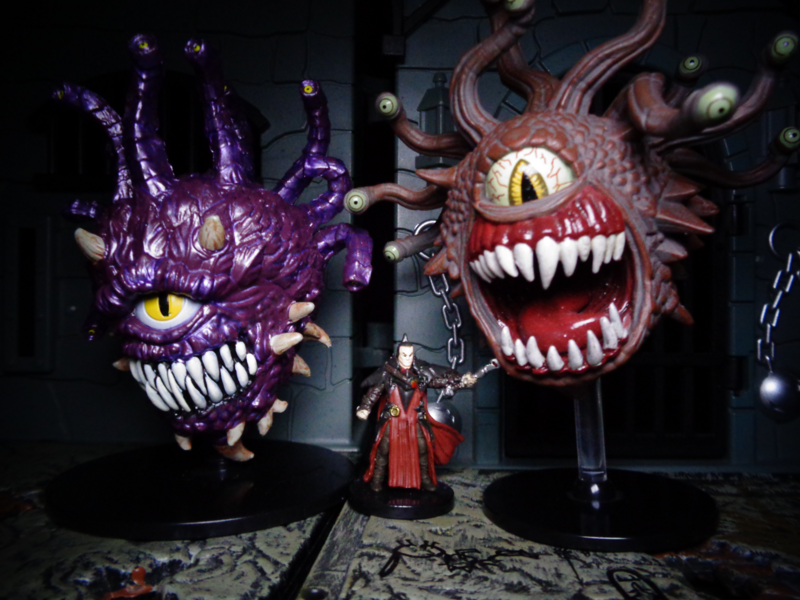 The Ultiate Tyrant is a huge-sized Beholder Variant, meaning that it’s roughly the size of a minivan. Everything about it is bigger and stronger than an ordinary Beholder’s version, including more lethal eye rays, stronger attacks, and a general sense of entitlement. But seriously, its eye rays can unravel a target, cause madness, wither, set everything on fire, and do all sorts of fun stuff. 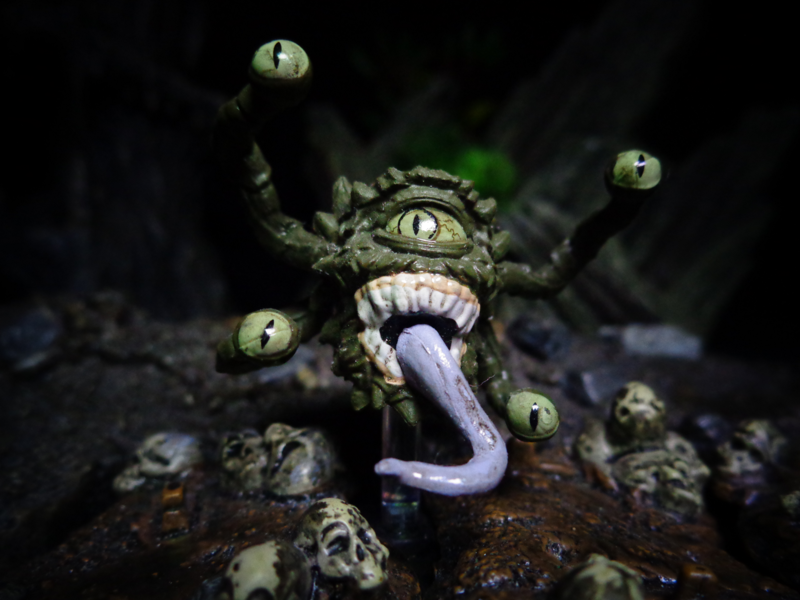 Now, there are a few Beholder variants in this size, such as the Hive Mothers. Although the Ultimate Tyrant was only in 4th Edition, this figure can sub in for any of them. 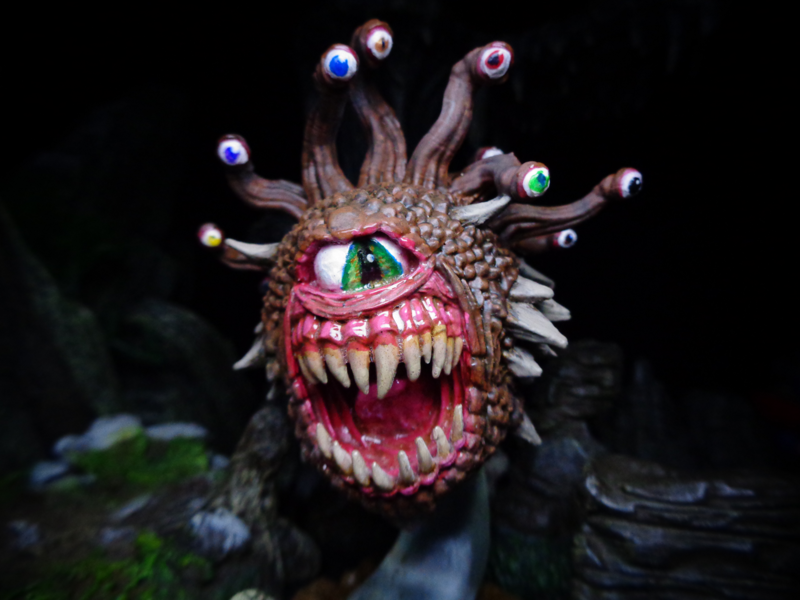 This is a Beholder from Nolzur’s Marvelous Miniatures. It is sold unpainted and unassembled, which you have to remedy when you own one. This one was expertly painted by (ANONYMOUS EBAY SELLER), and I am so grateful that (IT SLIPPED THROUGH THE CRACKS AND I GOT IT FOR CHEAP). 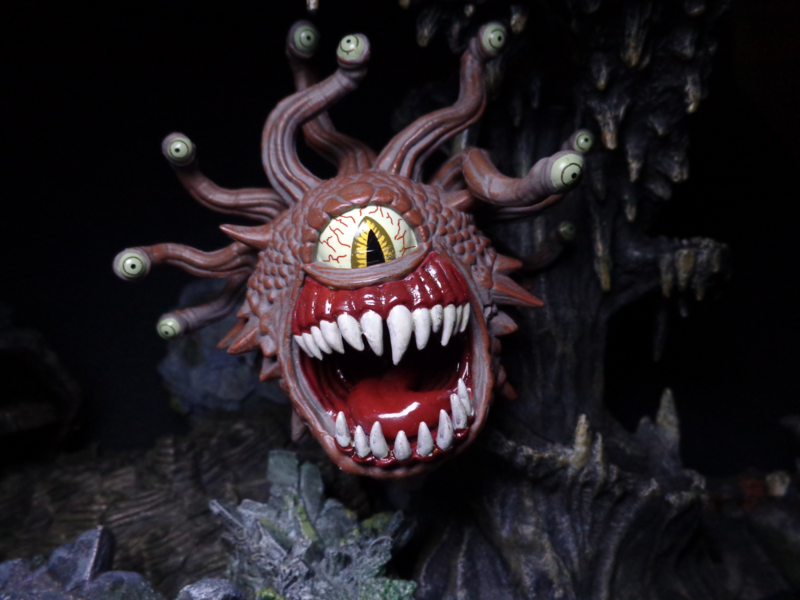 But seriously, it’s a fantastic-looking Beholder. if you have the skills to paint one, then definitely do so! 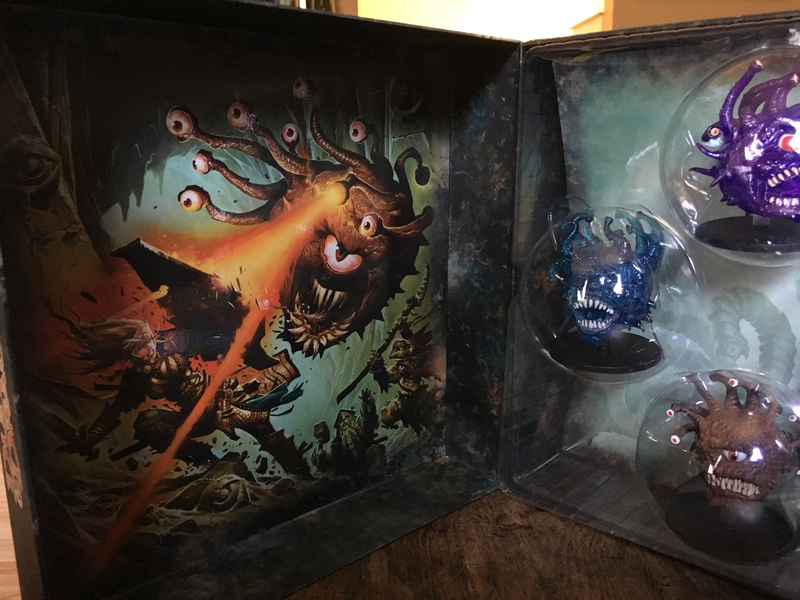 2015’s Rage of Demons set gave us a fantastic looking Beholder that… is way too big. Seriously, he’s the size of the Ultimate Tyrant, perched on a (comparatively) itty-bitty Large base. That said, it’s a fantastic figure, and even the mouth is fully sculpted! 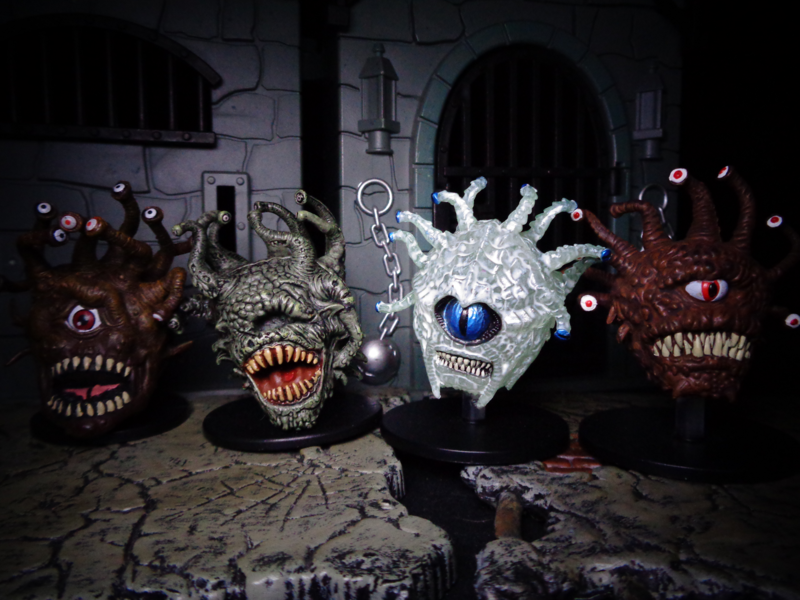 The same set also had a variant produced in mono-colored smokey gray plastic, as the “Shadow Beholder.” Not shown here. Rage of Demons also gave us the Spectator, a Medium-sized variant! It’s smaller, with a different variety of eye rays, and despite severe territorial tendencies it’s slightly more docile or reasonable than regular Beholders. Slightly. Skipping ahead to 2018 (there’s another Beholder in the interim) is the Gazer, a tiny variant! Gazers can sit on your shoulder! Gazers have an X in their big eye! 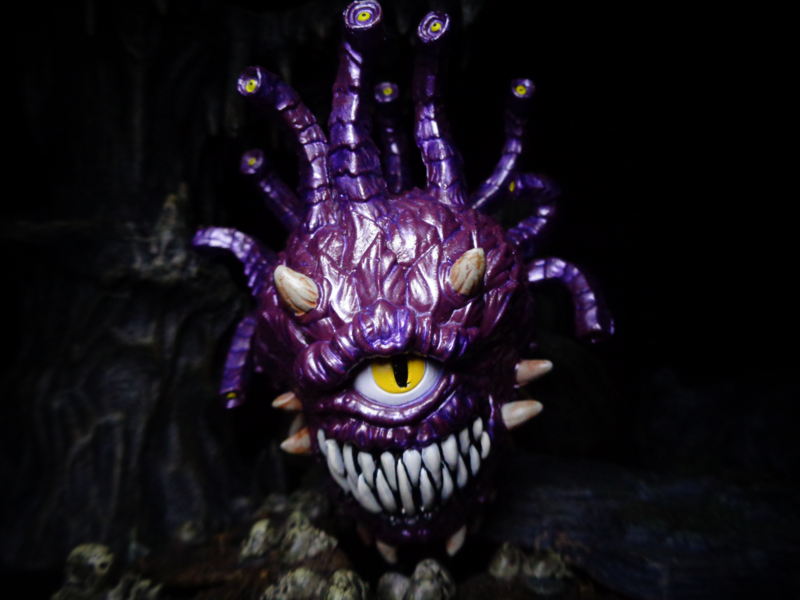 Gazers are as small as you would normally imagine Beholders to be. This is out of order because the Beholder before the Gazer and the one released after it are related. 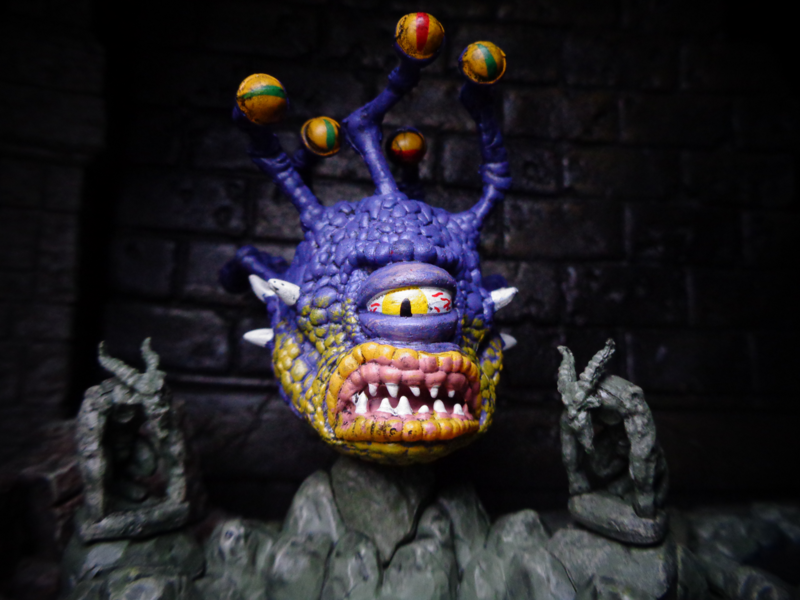 Monster Menagerie 2 in 2017 gave us a Beholder – and a unique one! He’s purple and yellow, instead of brown! lightly smaller than the others, too. The thing is, though, it’s one of those situations where they made a generic figure that was clearly meant to be a unique one (the Free League Ranger from Blood War was obviously Tanis Half-Elven from Dragonlance). This looks exactly like the artwork for Xanathar, the Beholder crime boss who runs the Xanathar Thieves’ Guild. What a smart move! 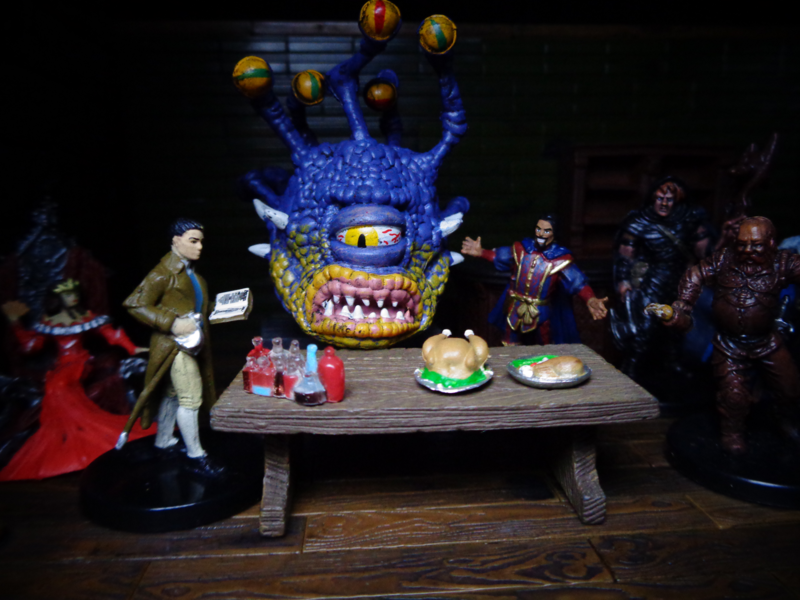 Oh by the way, they made a mini of Xanathar in September 2018. Oh whoops. Well, Xanathar is, uh… way different. Kinda. Part of the Waterdeep Dragon Heist set in 2018 (he plays a role in the adventure), this figure is smiling instead of frowning, has a different base/stand setup, and has jewelry on his eye stalks. Look, there are two figures of Xanathar. Deal with it. They’re both really cool. Their eyes look like croquet balls. The Xanathar is more of a title than a proper name. 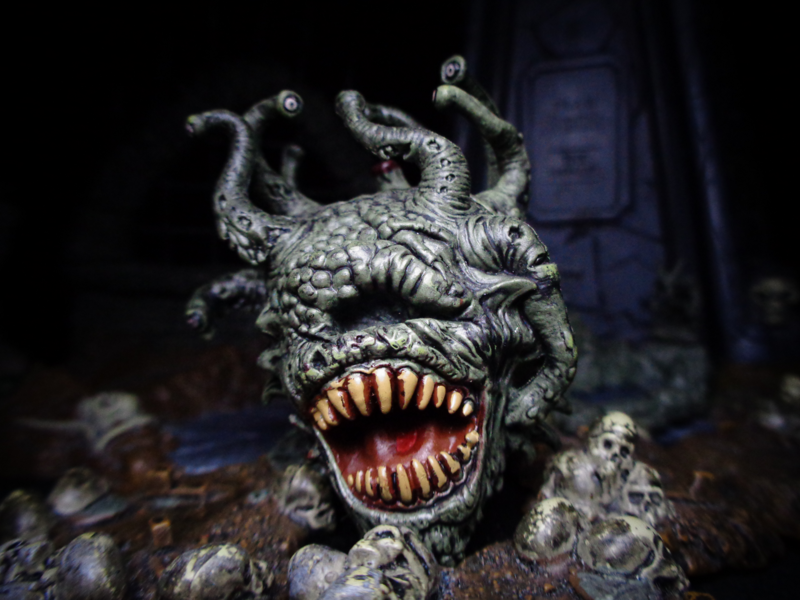 It was the name of the original Xanathar, but other Beholders have usurped the role since, taking the name and claiming that it’s the same guy. The Thieves’ Guild is one of the most successful criminal syndicates in the city of Waterdeep, and surprisingly few of its members know that their boss is a Beholder. Xanathar himself is insane and paranoid, but cunning and ruthlessly calculating. His best friend is a goldfish. Whenever the fish dies, his henchmen have to frantically replace it before he realizes what happened. Now while you’re laughing at that, he’ll order a hit on your family. Because even goofy crime bosses are still crime bosses. Yeah, see what I mean? The older one had a base that disassembles, but holds it up higher. The newer one is closer to the ground and more sturdy. 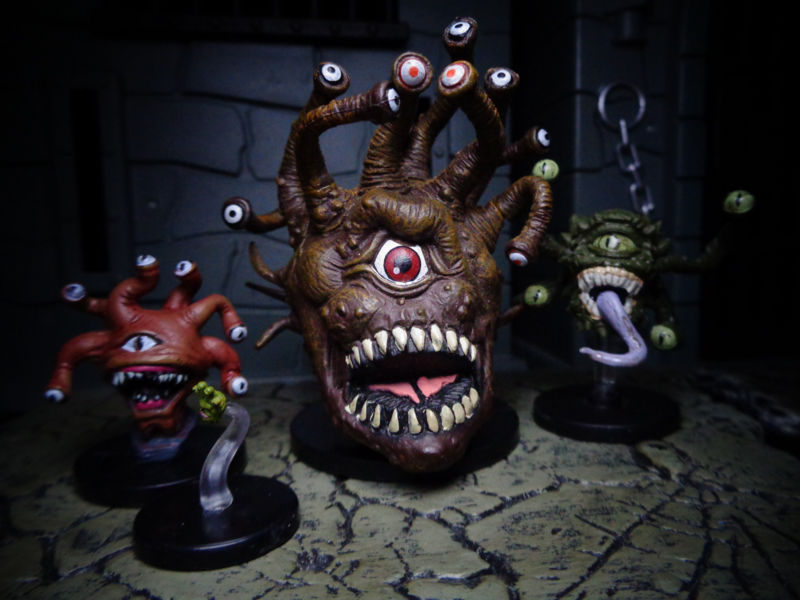 Here’s a basic Beholder size range. The Gauth and Spectator are notably smaller than the basic one, while the Gazer is just so cuuuuute! Other than that, the regular-sized Beolders are pretty consistent, overall. Well, sort of. Xanathar is kind of small and the oversized one is… well, big. One of these is Large and one of these is Huge. Part of me wonders if they made a mistake, part of me wonders if they meant to make a Huge figure but just weren’t producing the right size base. It’s still a great figure, though. Just a reminder that these things are a lot bigger than the creature in Big Trouble in Little China. 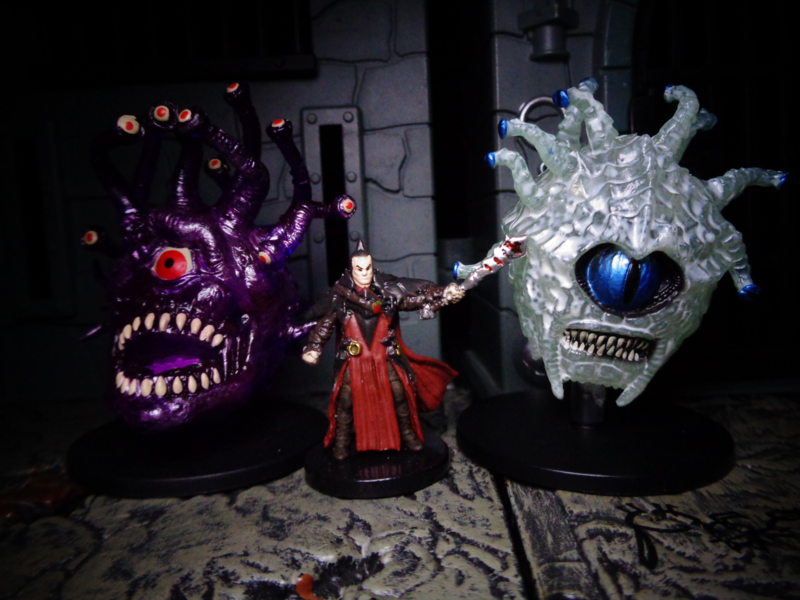 And that goes for normal-sized Beholders, too! Well, there you go! 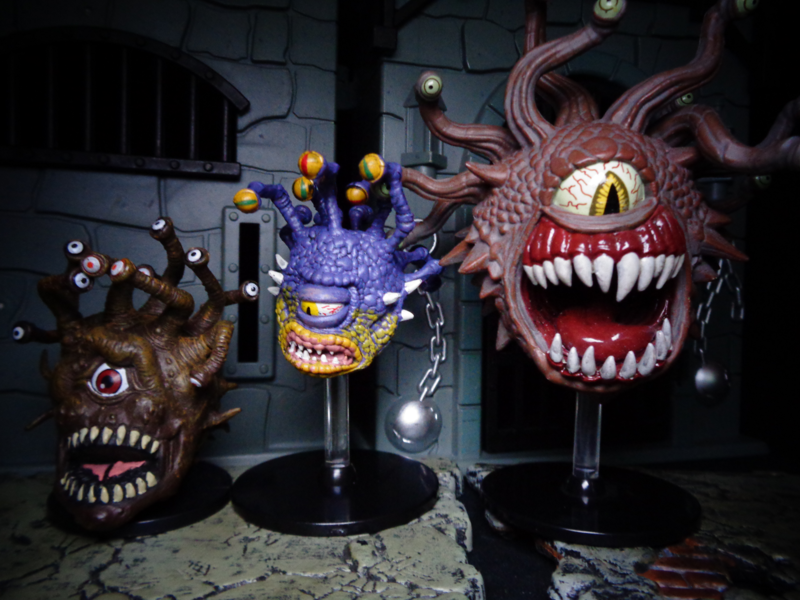 Beholders! Each mini is a thing of beauty, though unfortunately you would be wisest to grab them while they are new, before the secondary market jacks up the price. 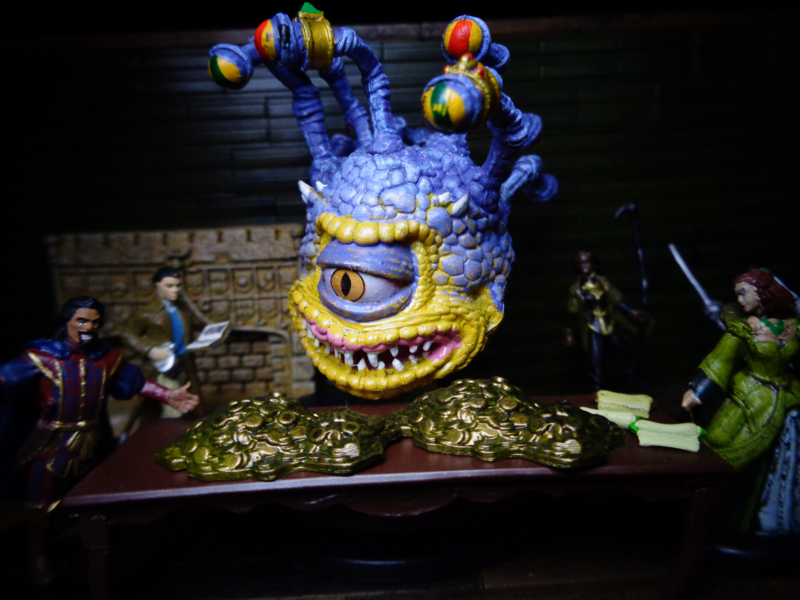 Still, one of D&D’s most iconic monsters looks as great on display as it does on the game table!